SYNOPSIS: The director of The Mummy and The Mummy Returns brings three of Universal’s classic monsters back to life like never before in the action-packed Van Helsing! 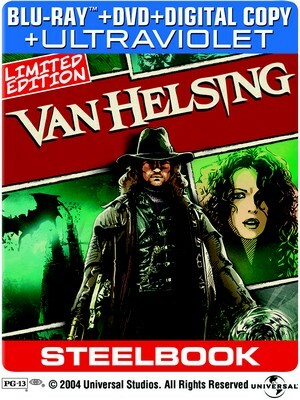 Legendary monster hunter Van Helsing (Hugh Jackman, X-Men) must rely on the help of the beautiful and mysterious Anna Valeris (Kate Beckinsale, Underworld) as he engages in an epic battle with the ultimate forces of darkness – Dracula, the Wolf Man and Frankenstein’s Monster! Get ready for non-stop action and spectacular adventure in this pulse-pounding thrill ride loaded with eye-popping visual effects and exciting bonus features! • You Are in the Movie! • The Masquerade Ball Scene "Unmasked"